Weaving our way through the Taste of Paris 2017 salon, we came to a table with a swarm of customers whose excitement was palpable. They clutched little plastic spoons and dove them into the jewel-toned jars of jam stacked around the table like children in a candy store. I'd never seen people so enthralled with jam and we quickly plucked up a spoon to join them in their flurry. This wasn't just jam; this was happiness in a jar. After our project mentor Chef Stéphane Gabrielly introduced us to Stephan, he immediately agreed to welcome us at his atelier to lend a hand in jam-making. We were ecstatic; even more so when he pulled us in tight for a firm handshake and slyly passed us a bag with three sacred pots of jam: Pineapple - Tahitian vanilla- Jamaican rum, Bergamot marmalade, and Cireine Strawberry. Everything that Stephan Perrotte touches turns to gold. This is no exaggeration; he's won medals and awards in every professional field he's entered and thus conquered. At the age of 15, Stephan was awarded the prize of Best Apprentice in Charcuterie, his first love. Stephan comes from a charcuterie and butchery family, his father and grandfather were highly respected intermediaries, and it seemed evident for Stephan to enter into the same line of business. Then he turned to baking and again excelled in creating unusual levains, then to cooking, amongst other food-related jobs along the way, before arriving at his current podium of World Champion Jam-maker. Tucked away amongst the charming chateaux of the Loire valley and miles of vines, lies Stephan’s atelier. After finding a vineyard where we could park our camping car for the night, we were up early with the stars to walk to the Maison Perrotte atelier, ready for work at 7 a.m. Stephan’s uncle, Jean-Luc, was there to greet us. Stephan was still in the Alpes participating in Les Chefs au Sommet d’Auron, so Jean-Luc and their sous-chef, Christelle, were in charge of production that day. Jean-Luc kindly made us a coffee and walked us through the isles of jam in their stockroom, introducing us to the history of the Maison, Stephan’s many successes, and the chefs that the Maison partners with to confection their custom confitures (Michelin-starred chefs such as Anne-Sophie Pic, Christophe Michalak, and Jean Sulpice, to name a few). You’d never guess that a company who works with such world-renowned chefs would be comprised of only three employees: Stephan, his uncle Jean-Luc, and Christelle, and that all stages of the fabrication are by hand. At 8 a.m., Christelle, a habitant of the local village, arrived for work and we quickly put our aprons on to assist her in the kitchen. We started with their award-winning Strawberry and Madagascar Vanilla confiture. Stephan insists that he’s not a jam-maker but someone who “cooks fruit,” which becomes very clear when you see the remarkable variety of flavors that he creates and how he makes his jams. First, we began by measuring out the strawberries. Yes, strawberries in January! We were shocked, as we were under the impression that Stephan works with seasonal fruits. The team explained to us that the frozen fruits they were using were either bought from a quality intermediary, Demain La Terre, who freezes their organic or eco-responsibly harvested fruits at peak ripeness or frozen by themselves in order to conserve maximum flavor. And when you understand the quantities of strawberry jam that the Maison Perrotte sells, you quickly see the principle of supply and demand in action. After measuring out the fruit in two batches, we weighed the sugar and the pectine. Stephan cooks his fruit in large copper pots made by the historic French company Mauviel, in three sequences. The first step to create the base texture, spreadable like a classic jam; the second is to add in the pectin (the quantity depends on the naturally-occurring pectin in the fruit itself) and the sugar (always white sugar made from beetroots, so that the fruit’s color will never be affected). Because Stephan uses less sugar than a traditional jam-maker, his jams cannot legally be classified as "jams" but rather as "fruit preparations." 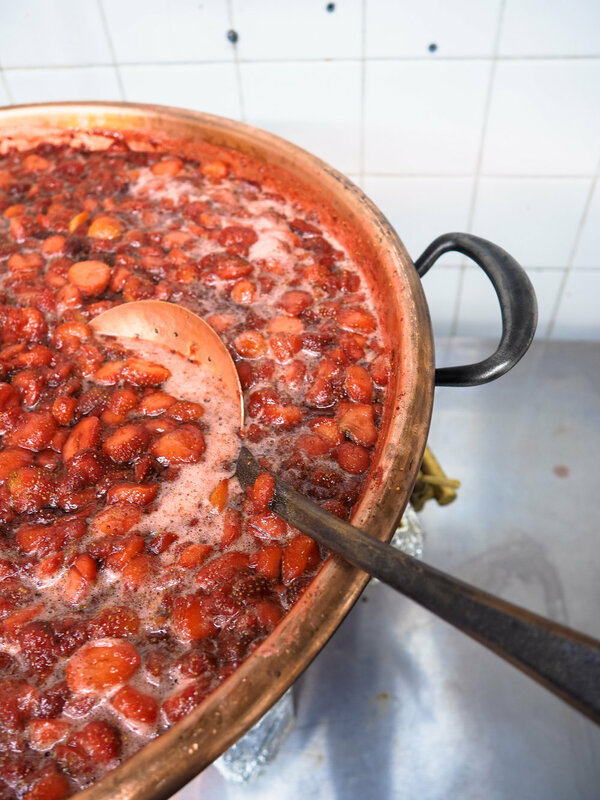 Lastly, the second batch of fruit is added in for a brief period of time, so that there is a variety of textures in the final pot of jam. The pots are all hand-filled to the brim, no skimping in this generous Maison, and plunged into hot water to wash the exterior and seal the jars. 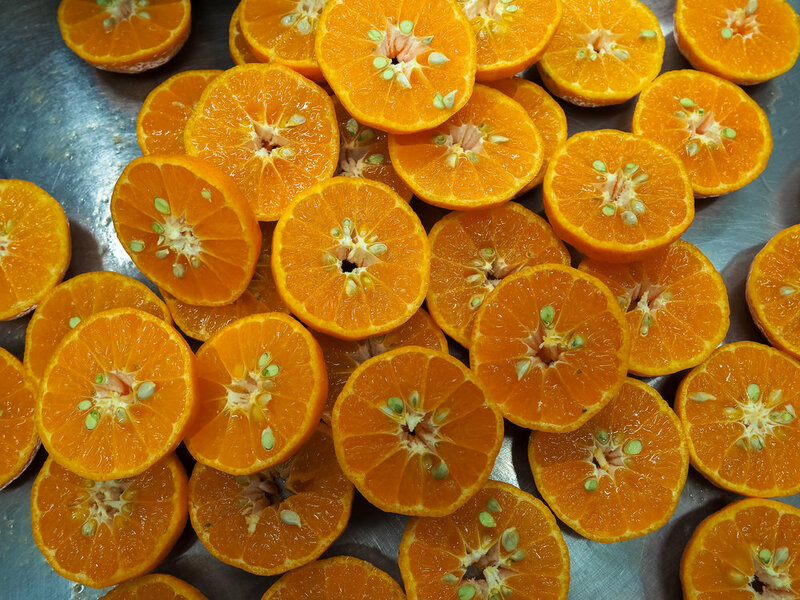 Once the kitchen had been entirely scrubbed down, we started working on the next fruit of the day: Mandarins from Palermo. Jean-Luc wheeled out about 50 kilos of fruit and we were told, with a big smile, that we had to de-seed all of the fruit with small knives and peel half of it. Jean-Luc laughed and told us that, alone, this task had taken him several days. When you tell two cooks, we’re always ready to attack and the four of us banged out about a third of the fruit before stopping at 1:30 p.m. for lunch and an afternoon rest. The jars of strawberry jam were happily popping away in the hallway as we left, pressurising after their sealing process. The next day, we were back at it again! Stephan had returned from the Alps and came into the kitchen to conduct a few jam tests for his clients. 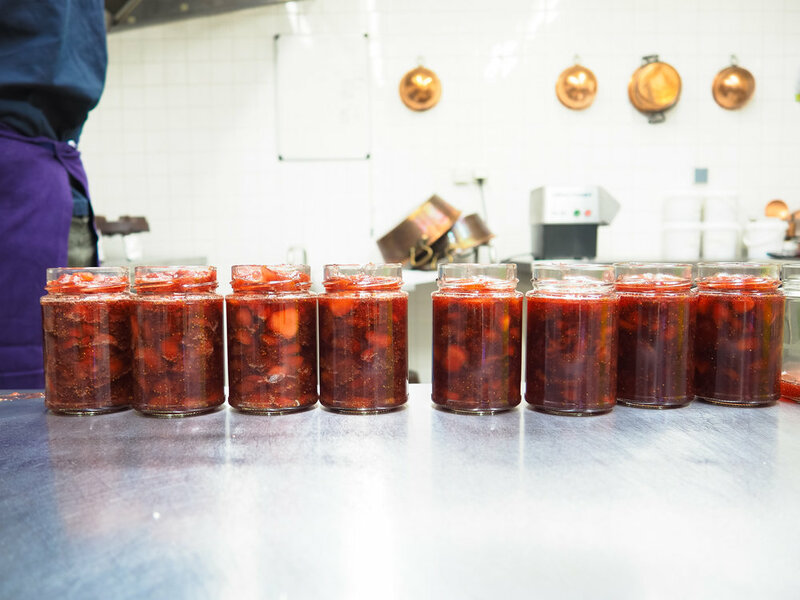 All the ingredients in each pot of jam is highly scrutinized and the quality measured, and so Stephan passes quite a bit of time doing research and trials to discover which recipes would achieve the best result. Apparently, when Stephan was conducting tests at home, he would have dozens of pots of jam lined up in the hallway and, as his family would fall asleep, they would hear the pots popping, too. His wife finally put her foot down and told him that he needed to find an atelier, or else the house would turn into a jam factory! Hands a bit rough from the citric acid, I thanked my lucky stars that I didn’t have any cuts on my fingers as we finished the last two-thirds of the mandarins. We got right into de-seeding and peeling and by noon we had finished! To be honest, it was the tangy perfume of the mandarin that got me through. I’ve never smelt anything like it in my life and was immediately transported to the crystal clear waters and bright sunshine of Sicily. When you’re cooking and set to repetitive, often menial tasks, it’s incredibly freeing to be able to meditate, kind of a highly aware and fluid rhythm, to help pass the time. We spent the rest of the afternoon packing up jars of Raspberry Rose and Strawberry Violet jam to be sent to Christophe Michalak stores across Paris and labelling the Strawberry Madagascar Vanilla jars that we had made the day before. Everything from the ingredients to the labels and packaging are greatly considered and Stephan has created a gorgeous product from A to Z. Before heading back up to Brittany to visit our next producers, Stephan brought us to his neighbor's farm: Un Champs, Un Cheval. Harald Hermans is an incredible farmer who grows absolutely stunning mini vegetables for well-known restaurants in Paris like the Clown Bar, Semilla, and Saturne. We truly hope to go back at Un Champs, Un Cheval to be able to learn more about organic farming! C’est sur le salon Taste of Paris 2017 que nous avons rencontré Stephan Perrotte pour la première fois, puis nous avons eu la chance de passer deux jours dans son atelier. Stephan Perrotte a été médaille de bronze au concours du meilleur apprenti charcutier de France, puis boulanger primé en région avant d’être confiturier. Et quel confiturier ! Je ne peux faire ici la liste de tous les prix qu’il a reçus pour ses créations, mentionnons uniquement qu’il est devenu champion du monde de confiture en 2015. Cela n’aurait pas été possible sans beaucoup de temps, de travail et d’exigence. Pour les fruits, Stéphan travaille avec l’association Demain La Terre qui respecte une charte exigeante en termes de qualité produit, protection de la nature et respect des producteurs. Cela lui permet de produire même hors saison pour satisfaire les envies des consommateurs, sans pour autant rogner sur ses principes. Il propose par ailleurs une gamme « fruits frais », pour laquelle il travaille avec des producteurs haut de gamme (bio et raisonné) et uniquement en pleine saison. Ces créations sont reconnaissables à leur couvercle couleur cuivre. Stephan privilégie un sucre de betterave naturellement blanc fabriqué dans le nord de la France, plutôt qu’un sucre de canne raffiné et produit à l’autre bout du monde. Nous avons passé la première journée avec Christelle et Jean-Luc, l’oncle de Stephan, qui nous ont accueilli très chaleureusement. Au menu, cuisson de la confiture « Fraise, Vanille de Madagascar » pour laquelle Stephan Perrotte a reçu la médaille de bronze au Concours Général Agricole 2013. Les odeurs qui se dégagent des chaudrons sont un délice pour les narines mais une véritable torture pour les gourmands. Le remplissage des pots se fait à la main et à chaud ; le reste de la journée est rythmé par le son des pots qui claquent, signe de bonne stérilisation. Puis c’est au tour de la confiture de saison « Mandarine de Palerme et Clémentine du Vésuve ». Epépiner et peler les mandarines est un travail fastidieux mais nécessaire afin d’éviter l’amertume (et les pépins !). Encore une fois, les parfums nous enivrent. La mise en place terminée, c’est le grand nettoyage et nous repartons dans notre camping car avec deux pots de confiture pour notre petit déjeuner. Merci Jean-Luc ! A 7h le lendemain, Stephan nous accueille avec un café, il revient du festival des chefs au sommet où il a offert son moelleux au chocolat cuit au barbecue, un grand succès. Il ouvre un pot de confiture « Orange, Orange fumée et Whisky Hibbiki » qu’il confectionne pour la cheffe Anne-Sophie Pic. Le nez fumé léger, l’orange dominante, puis en fin de bouche le whisky japonais plein de saveurs… La longueur en bouche est surprenante, l’équilibre parfait. Stephan nous fait ensuite découvrir un pot de confiture « Abricot Bergeron ». Là encore, l’impression de croquer le fruit est hallucinante ! Ces abricots viennent d’une petite productrice et de quelques 300 très vieux arbres qui ne donnent que 500 kg de fruits. Comme toujours, la qualité est privilégiée, pas la quantité. Malgré les concours et les prix, Stephan est une personne très humble, échangeant avec une extrême générosité sur son travail et ses expériences. Son cerveau semble toujours en mode recherche. Le leitmotiv de ses créations est de privilégier le fruit et de mettre le moins de sucre possible. Il est d’ailleurs en dessous des normes européennes, ce qui lui enlève le droit d’utiliser l’appellation confiture… allez comprendre ! Il mélange les saveurs dans sa tête avant de l’exprimer dans ses chaudrons. Cela ne l’empêche pas de faire des contrepieds gustatifs comme pour sa confiture « Abricot, Poivre de Timute », dans laquelle le poivre apporte une note de pamplemousse et donne un goût plus franc à la confiture. Notre journée se poursuit par la coupe des mandarines avant cuisson. La taille des fruits est importante pour garder de la mâche et éviter les cuissons trop longues qui apportent de l’amertume. Vient ensuite l’étiquetage à la main, la mise en carton et la préparation des commandes. Les noms des grands chefs et des pays défilent sous nos yeux. Pour clore ces deux jours, Stephan arrive les bras chargés de confiture, afin que nous puissions les partager avec notre famille et les faire découvrir lors de nos prochaines rencontres (je vais en cacher dans le camping car, elles partent bien trop vite !). Ultime cadeau et nouvelle preuve de sa générosité, Stephan tient à nous présenter Harald Hermans, véritable ovni de la culture et de la production maraichère. Il mériterait que l’on fasse un film sur lui ! Vous trouverez prochainement son portrait sur notre compte Instagram, mais n’hésitez pas à suivre sur son compte Facebook. A vos cuillères, et régalez vous sans modération !